This entry was posted in Uncategorized and tagged Bea, Sasha Studio doll, Suzanne by mountainmullins. Bookmark the permalink. So beautiful. So you just sit and smile at them? I’m thinking I would. Oops, that was supposed to be do not so. Welcome Bea, you will love your new home. Ginger she is gorgeous you must be very happy to be able to add her to your cow creek family. Her dress is lovely and also her little pin, lamb and tiny troll. Bea is just beautiful, Ginger. I love how your girls wear jewelry from your family or childhood. It’s a lovely way to enjoy them still. I had a troll doll too. I haven’t seen one in many years! Thank you for sharing. Thank you Peggy. My childhood dolls were all given away except for this troll doll which hid in the back of a drawer. I am so glad to have it and he looks at home with the Sasha dolls. I am so happy to see Bea settling in, what thrills me the most is seeing her beside Susanne as, there is Susanne with her dark brown opaque eyes and then Bea with her semi translucent eye treatment, made by pressing a course weave fabric onto the eye paint whilst wet and lifting it off to create that amazing pattern. It’s like Sasha created the girls at a similar time, looked at Bea and thought to try something different to soften and lighten her eyes. Then with that lighter eye came the lighter lips and now how different do they look? Bea is an amazing and unique doll, I have never seen that treatment before and it delights me! IMO this is one of your best and most interesting posts EVER!!! You couldn’t have chosen a better coloured dress for Bea! It was just MADE for her to wear with her colouring. BTW did she come to you with any of her original clothing as I’d be interested in knowing just what colour she had worn when Sasha painted her? Could it have been that brown/white check dress that we see her wearing in one of the above photos? Thanks girls for your good wishes for the coming week… AND thank you Ginger for this truly delightful post. Thank you Kendal for your lovely comments. I really appreciate the support for Bea’s blog post. I thought I would wait for some sunshine to take photos outdoors but that might takes months here since we have had rain and snow daily for quite a long time. So I turned on all the lights possible in the room and hoped everyone would understand the shadows and darker photos. Bea came in a very cute brown checked dress made by Thu Cuc Faes and she did not have any of her original clothing. The only background I have on the dear girl is that she is thought to have once been a school girl. Knowing this, I have asked Brigitte if she would make her a school girl outfit and she kindly agreed. I think I will pick it up in May at the SCW (which I am so excited to be able to come this year). 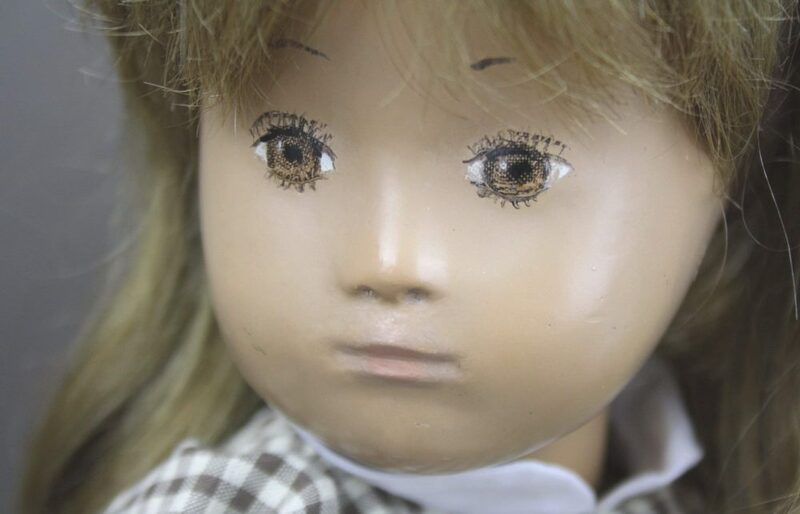 I am making a similar journey as you with picking favorite face molds for the studio dolls. Mold III has always been my first choice with its classic, strong and beautiful profile. Then Mold I was next as a favorite which is the mold of Abby, Addy, and Brigitte and the course dolls. Now though with Bea joining the family, I have taken a step back in looking at the dolls. She has taken me to the moon and back and so I am very smitten with her II face mold and it is now at the top of list. Thanks so much for your excellent story of Bea’s arrival at Cow Creek. I look forward to more photos when outdoor picture taking becomes possible!! Your posts welcoming new Sasha dolls to your family is delightful and informative. You provide such a pleasure both to read the text and to see the photos. Keep waxing so eloquent.!! She’s amazing, with eyes that are as exquisite as they are unique. She and Suzanne are wonderful sisters – both similar, but also with their own distinct personalities. Gosh Ginger! You are right about these two. They look very similar. Them having the same hair color really draws a person in to take a closer look. Although there are significant differences too. Both are amazing and true treasures to behold. Well done on the choice of dress for Bea too, as it really coordinates with her amazing eyes. Congrats for adding Bea into the fold at Cow Creek. WOW, what a gorgeous girl Ginger, she’s beautiful and yes, her eyes are amazing, such detailing. I think the two girls look so lovely together, like real sisters and nice that Suzanna is just that little bit taller, making her the big sister to little Bea. Congratulations on such a lovely new addition to your family.